ARASH ZEINI: Two reviews. The reviews, neither of which is online, are both in Zion and are of Secunda, The Iranian Talmud (background here, here, and links) and Secunda and Fine (eds. ): Shoshannat Yaakov, Jewish and Iranian studies in honor of Yaakov Elman (background here). Following recent intertextual studies, Kyle B. Wells examines how descriptions of ‘heart-transformation’ in Deut 30, Jer 31–32 and Ezek 36 informed Paul and his contemporaries' articulations about grace and agency. Beyond advancing our understanding of how these restoration narratives were interpreted in the LXX, the Dead Sea Literature, Baruch, Jubilees, 2 Baruch, 4 Ezra, and Philo, Wells demonstrates that while most Jews in this period did not set divine and human agency in competition with one another, their constructions differed markedly and this would have contributed to vehement disagreements among them. While not sui generis in every respect, Paul's own convictions about grace and agency appear radical due to the way he reconfigures these concepts in relation to Christ. TZEMAH YOREH: The Sacrifice of Isaac in Context. Recovering a Lost Ending of the Akedah (TheTorah.com). HT Seth Sanders on Facebook. An interesting article that takes up and develops a case made by Shalom Spiegel in The Last Trial (see n. 26) that in the original story of the Aqedah (the Binding of Isaac) Isaac was not only bound, he was actually sacrificed by Abraham. Indeed there is a good case that there is more going on in the Akedah (Genesis 22:1-19) than first meets the eye. But that said, there is a piece of evidence missed by Dr. Yoreh which partly supports his argument, but overall raises serious difficulties for it. He accepts a source division of the passage based on the use of divine names: Elohim ("God," used by the E source or Elohist) throughout the narrative except in vv. 11 and 14-15, where YHWH ("the LORD," typical of the J source or Yahwist) is used instead. Then by omitting vv. 12b and 13-14 (and presumably vv. 15-18 also) as Yahwistic additions, he reconstructs an original Elohistic story in which no angel intervened and Isaac was sacrificed. The piece of evidence I mentioned is literally a piece, a fragment of Genesis 22 preserved in our earliest surviving manuscript of Genesis, found among the Dead Sea Scrolls and called 4QGenesisExodusa. 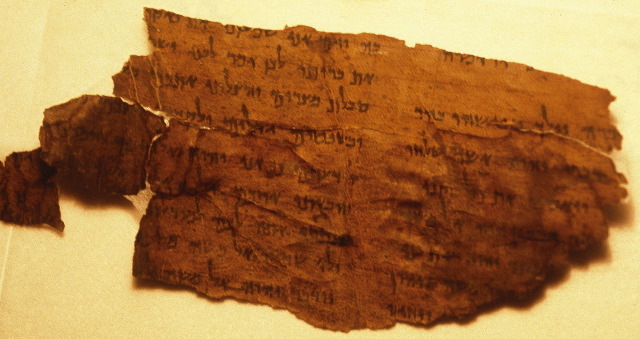 * This fragment has just a bit of v. 14 on it: אלהים יראה אשר יאמר. (Some of the letters are damaged or missing, but the readings are not in doubt.) So the place name in v. 14 is called "Elohim Yir'eh; as it is said ... ." The Masoretic text here reads "YHWH Yireh," so this fragment supports the suggestion that the original version had Elohim. Indeed, this phrase refers back to the beginning of the verse where Abraham uses the phrase "YHWH Yir'eh," translated something like "YHWH will see to it." The implication is that the original of that phrase also used Elohim. Moreover, the reference to "the"Angel of YHWH" in v. 11 is read in the Syriac version as "the Angel of Elohim." So we see a pattern, enough of one to suspect that the use of YHWH in "the Angel of YHWH" in v. 15 is also secondary and it originally read "the Angel of Elohim." In other words, the fragment from the Dead Sea Scrolls gives us very good reason to infer that the whole passage originally read Elohim throughout. So far, so good. The problem with Dr. Yoreh's theory is that v. 14, which he wants to delete as a secondary addition by the Yahwist, also originally read Elohim and therefore was probably part of the original E story. Or at least the original use of the divine name gives us no reason to suspect that the Yahwist has added the passage. One could still argue that the verses he deletes are secondary additions and that still gives us an Aqedah in which Isaac wasn't saved, but the argument is much weaker without the change in divine names. I still suspect that an earlier version of the Aqedah did involve the actual sacrifice of Isaac, although what happened next is far from clear. Did Isaac die and rise again like Baal? I don't know. Yoreh suggests (n. 33) that in E Abraham was not the ancestor of Jacob, which is also possible. But any such speculative reconstructions have to proceed without the help of traditional source criticism based on the use of the divine names. *I published the fragment in "The Name of God at Moriah: An Unpublished Fragment from 4QGenExoda" in JBL 110 (1991): 577-82. The entire manuscript was later published in DJD 12. Incidentally, the handwriting of this fragment is the same as in the rest of the manuscript. And I reconstructed the whole manuscript and discovered that 22:14 came right at the top of a column, and the fragment does show the top margin of a column, so despite it's small size it is clearly a fragment from this part of Genesis in this manuscript. UPDATE: I see I have an earlier post from many years ago which refers to Spiegel's reading of the Aqedah. MANUSCRIPTS GALORE: In Jerusalem, a glimpse of Newton’s apocalypse, smuggled Syrian bibles, Kafka’s Hebrew As it pioneers a worldwide initiative to digitize every Hebrew manuscript in existence, Israel’s National Library offers a rare and tantalizing sight of its most prized treasures (Daniel Estrin, AP). For the recently destroyed Jobar Synagogue, see here and links. For more on two of the "crowns of Damascus," see here. More on Isaac Newton's theological views and writings is here, here, and here. There's more on the Israel National Library's Hebrew manuscript digitization project here and here. And there is much more on many other manuscript digitization projects here, here, and here, and links. THIS WEEK'S DAF YOMI COLUMN BY ADAM KIRSCH IN TABLET: The Study of Law as a Spiritual Act: Finding Truth and Meaning in the Talmud. Two years and 100 columns in to the Daf Yomi cycle, our critic pauses to reflect on its intellectual challenges and delights. This week, punctuated for all Jews by Yom Kippur, also marks a particular transition for Daf Yomi readers. After two years, we have finally come to the end of Seder Moed, the division of the Talmud that deals with Jewish holidays. In that time, we have read hundreds of pages on the laws of Shabbat, in Tractates Shabbat and Eruvin, and learned the laws of most of the other major Jewish holidays—Rosh Hashanah and Yom Kippur, Pesach and Sukkot and Purim. We’ve learned about laws that apply to all festivals, in Tractate Beitzah, and those that apply only to the intermediate days of festivals, in Tractate Moed Katan. And we’ve read about rituals from Temple times that have not been practiced for almost 2,000 years—such as the collection of tithes, in Tractate Shekalim, and pilgrimages to Jerusalem, in Tractate Chagigah—but have remained a subject of study for all that time. As it happens, this week also marks the 100th installment of my Daf Yomi column. These two milestones have led me to step back from the daily routine and reflect on what I have learned over the past two years of exploring the Talmud. I’ve been further prompted in this direction by reading a new book, The Talmud: A Biography, by Harry Freedman, which offers a brief history of the Talmud and the role it has played in Jewish thought and practice. So important is that role, so ubiquitous is the Talmud in Jewish culture, that the later parts of Freedman’s book tend to blur into a history of Judaism in general, taking in everything from Spinoza’s secularism to the miracle-working of the Baal Shem Tov. Insofar as I know about the subject (and it is by no means my specialty), this column seems to be a nice brief summary of the current state of Talmudic studies. Freedman's book has also been mentioned here. I don't have the time to participate in Daf Yomi, but I have learned a lot just from reading Mr. Kirsch's columns. I look forward to five more year of them. Biblical background to the festival is found in Leviticus 23:39-43 and Deuteronomy 16:13-15, with mentions also in Deuteronomy 31:10, Zechariah 14:16-18, Ezra 3:4, and 2 Chronicles 8:12-13. And there is one mention in the New Testament in John 7:2. Past posts dealing with the historical background of the festival are here, here, here, here, here, here, here, and here. Herman, "The Babylonian Talmud and the Paikuli inscription"
ARASH ZEINI: The Babylonian Talmud and the Paikuli inscription. A new article in Zion by Geoffrey Herman. BOGUS: Newly-Found Document Holds Eyewitness Account of Jesus Performing Miracle. In case you happened to see this article, which has been making the rounds on social media, it is a rather well-done, playful hoax on a site that likes to publish playful hoaxes. That pretty much sums it up, but Snopes has some more details: Miracle Witness. Anyone who knows about Historical Jesus research would have been pretty sure it was a hoax as soon as they saw it. A real thing like this would have been all over the media with extensive responses from specialists. Think of the response to the Gospel of Jesus' Wife back in 2012, only more so. HERSHEL SHANKS: First Person: A New Target (BAR). That target being Mr. Shanks himself. Paleographer Ada Yardeni has convinced him that the Ivory Pomegranate inscription may be a forgery. Most specialists think that, although the artifact itself is a genuine antiquity, the inscription is a modern forgery. Background here, here, and links. FOR SUKKOT: Rare ‘Four Species’ Coin from Bar Kochba in Display in Israel. The exhibition includes the largest gold medallion with Judaic symbols known in existence (The Jewish Press). A rare silver coin with an inscription from the period of the Bar Kochba revolt is on display at the Israel Museum through the week-long Sukkot holiday, which begins Wednesday night. The report of the discovery was noted here last year. The gold medallion was also recently on display in the Jerusalem of Gold exhibition, noted here. "When the Greeks Ruled Egypt"
EXHIBITION: Multiculturalism: Nothing New.‘When the Greeks Ruled Egypt’ Highlights the Diversity of Cultures in Ptolemaic Egypt (John Noble Wilford, NYT). For the three centuries from Alexander the Great to Cleopatra, Greeks ruled Egypt not so much as foreign conquerors but as the next dynasty in the long line of pharaohs. It was not out of character for Alexander himself to assume the power and status of a pharaoh, not to mention the promised fringe benefit of a grand afterlife and kinship to the Egyptian gods. Their overriding policy was not to demand assimilation but to accept many ways of life. No official language was imposed for all purposes. Government affairs were often conducted in Greek, but also in Demotic, the local everyday language derived from the more formal hieroglyphs. Jewish and other immigrants often spoke and wrote Aramaic. There is a certain amount of idealization and cultural projection here. Ptolemaic Egypt did not lack for Greek cultural imperialism, but the rulers were also very pragmatic and they accepted a great deal of cultural variety as long as the taxes got paid. In any case, sounds like an interesting exhibition. CHRONIC OFFENDERS: Second Temple Period Mikveh Unearthed in Valley of Elah. Archaeologists stunned to find inscription by Australian soldiers from World War II alongside 1,900-year-old Jewish ritual bath (Ornit Etzer, Ari Yashar, Arutz Sheva). Nowadays you get busted for leaving graffiti on ancient ruins. I pinched the opener of this post from the title of a science fiction story by Spider Robinson. What is the connection between Morris Loeb, the eccentric but brilliant scientist, and the Loeb Classical Library, a collection of more than 520 Greek and Latin volumes published by Harvard University Press and now entering its digital age? Morris’s strong-willed decision to go into chemistry instead of joining the family investment-banking business reportedly led to increased pressure on his younger brother James (Harvard ’88) to become part of Kuhn, Loeb & Co. with their father, Solomon. James, a sensitive lover of literature and music and a gifted cellist, reluctantly gave up a potential career as an archaeologist or a classicist to join the family business. But he never lost his love of Greek and Latin. And one result of his thwarted passion for antiquity was his decision to create the Loeb Classical Library in 1911. A fun article on the background and history of the LCL, inspired by its recent digitization and full of interesting details. HT Ellen Birnbaum. For more on the LCL and its digitization, see here and links. IMPORTANT RESEARCH: Israeli wine researchers aim to revive ancient libations. Matching indigenous grapes with archaeological finds, Elyashiv Drori hopes to recreate the drinks enjoyed by King David (Ben Sales, JTA/Times of Israel). ARIEL, West Bank (JTA) — The small cardboard box in Elyashiv Drori’s palm looks like it’s full of black pebbles. Closing the box quickly, he explains that it cannot be open for long. The pebble-like pieces, which were uncovered in an archaeological dig near Jerusalem’s Old City, are in fact remains of a kilo of grapes stored nearly 3,000 years ago. They were preserved under layers of earth from the era when David and Solomon ruled over the Land of Israel. Next to his laboratory at Ariel University, Drori — an oenophile who has judged international wine competitions — already has barrels of wine made from grapes that have grown in Israel for two millennia. Finding a living sample of the 3,000-year-old grapes will be the next step in his years-long quest to produce wine identical to that consumed in ancient Israel. A recent potentially relevant story is noted here. And for similar efforts to resurrect ancient beer, see here and links. VOLUME TWO: Anton’s Newest Book Enchants (Sybil Kaplan, The Jewish Journal). An enchantress is usually defined as a magician, sorcerer, enchanter or wizard. “Empress” features Hisdadukh, the daughter of Rav Hisda, and is set in Babylonia from 299 C.E. to 359 C.E. I think "Empress" is a typo for "Enchantress." More on Anton, this latest book, and her earlier novels is here and links.